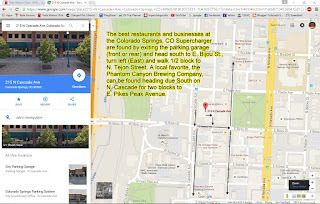 The Colorado Springs Tesla Supercharger is at 215 N. Cascade Ave., Colorado Springs, CO. It's 8 stalls, no waiting. Please see the map below to quickly get to local businesses and restaurants. Welcome! If you stop by there during BUSINESS HOURS, you just take a ticket. When you leave, you give the attendant the ticket and tell him/her this is a Tesla. If you were there for less than an hour, your visit is free (for Teslas). If more than an hour, it is $0.75 per additional hour. Now, if you come by there during NON-BUSINESS hours, it will cost you $1 (Parking Fee). Sorry! BEST WAY: Have a new $1 bill on hand. When you pull into the parking garage, just put the $1 bill into the bill accepter. The gate will go up and you are in. The EIGHT superchargers are off to your left. THEORETICALLY, the entrance machines also take COINS, and SOME credit cards! Look on the machine. If your brand of credit card is not pictured, it won’t take it! CASH IS KING! Tom, see my reply (below). I sent you a private message with an invitation. We're glad to have you on board! You're correct, Tom. Our LEAF members use Plugshare.com and their Nissan dealerships as en-route chargers.Our VOLT members, as far as I know, don't charge anywhere since they have range-extending engines. I'll send you an email to join our group, please come to our monthly meeting Feb. 6!